Some people just haven't got enough to do really, have they? Bad news from my agent yesterday - things are not sounding at all hopeful. The vacuum cleaner remains unlocated. My parents' visit has been postponed until I am feeling less of a misery. It would, we agreed, be better to wait until after the dismal anniversary on the 11th. In the meantime I am tempted by a job as a post-doctoral researcher in the department of chemistry at Liverpool for which I seem to be ideally qualified (albeit a long time ago now). The only trouble is if I were to get this job (which sounds so very interesting) I think it would take all of my energy. As much as I would like to pretend to myself I would still write (in my 'spare time') I don't think I would. The deadline is tomorrow so I have just today to decide. There will now be a short blogging break; my parents are making one of their rare but welcome visits which means I have to find the vacuum cleaner and clear up the house. 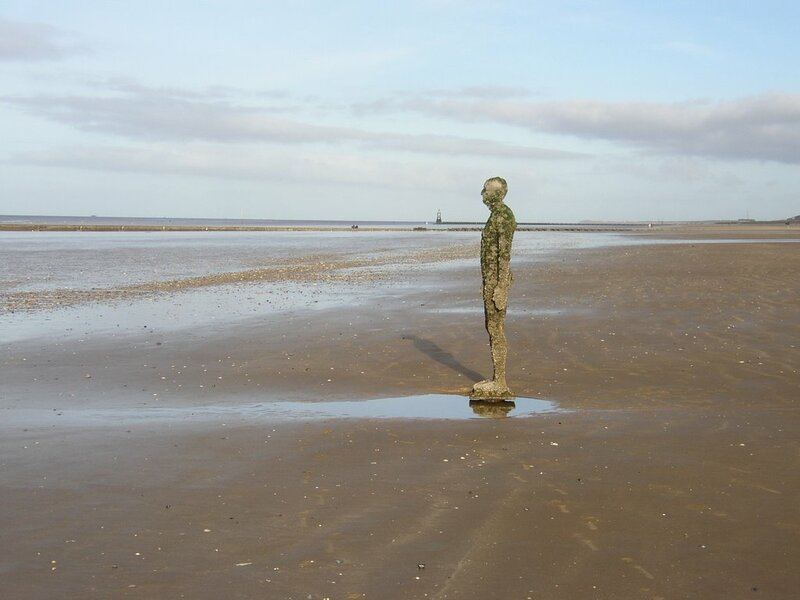 in order to see the installation ANOTHER PLACE by Antony Gormley, the artist who is responsible for THE ANGEL OF THE NORTH which guards the entrance to the north (east) of England alongside the A1(M). This is the work's fourth location - it has previously been installed in Cuxhaven in Germany, Stavanger in Norway and DePanne in Belgium and next month is scheduled to move again. Even though there are 100 statues they seem alone on the beach - each one divided from the next by metres of sand. They cannot connect. 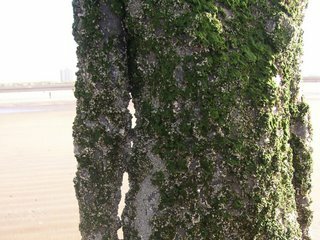 It is as if the shoreline is their consciousness - infinitely large - and limited only by the imagination. 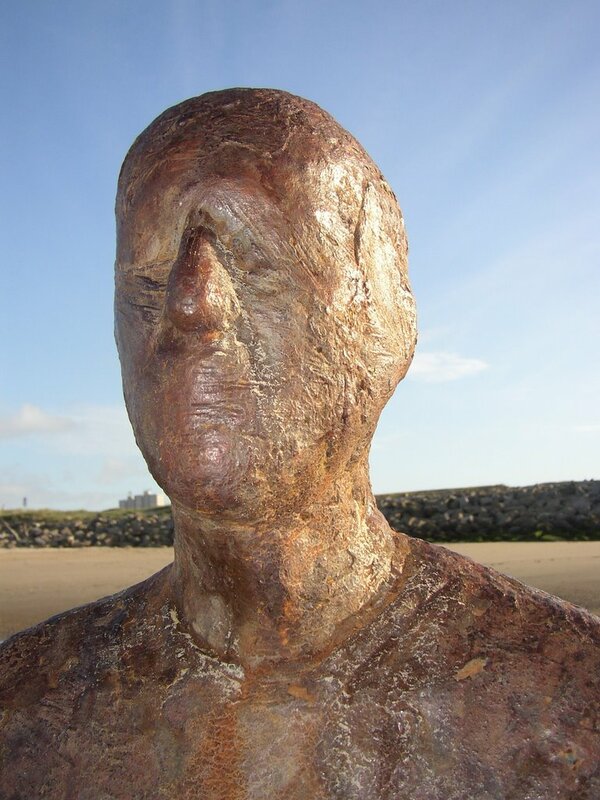 and here is 49 - the one with the face that remains above water even at high tide. The rain and sun weathers them and then washes parts of them away; it smoothes and removes cracks and lines, frowns and smiles. 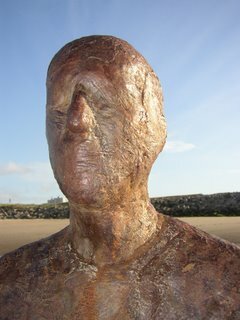 Soon it is as though the face is covered; as though a skin grows there like a stocking mask or a cataract...and once again there is that feeling of isolation. The sun rises and sets. The tides come in and out. The statues stay. 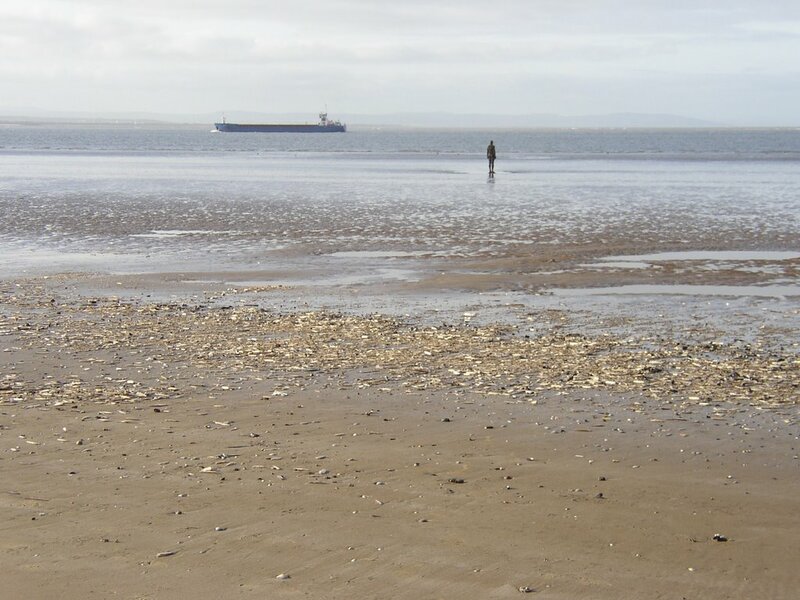 They wait with a Canute-like patience. Aloof. Silent. 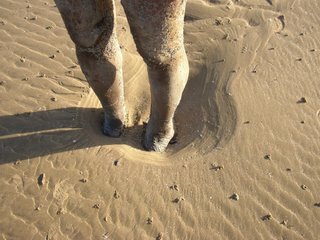 They don't notice the sand swirling and making patterns at their feet. It is as though they are concentrating on some deep truth. They know they are trapped as we all are; fastened down by a column of concrete they are forced to stay where they are and free to ponder and draw conclusions. Everything is an illusion; they seem to be telling me. If we were to reach out the moment would be already gone. Too late. We see without knowing. We do and then we think. Neurons set fire to great networks across our brains but we understand nothing. It is pointless to try. The longer they stand here without moving they know that it's true. Time passes over them like a cold sea and it changes nothing. Ships pass and they know that nothing matters. People stand before them and look into their faces but it doesn't shake them from their apathy. All they can do is watch. 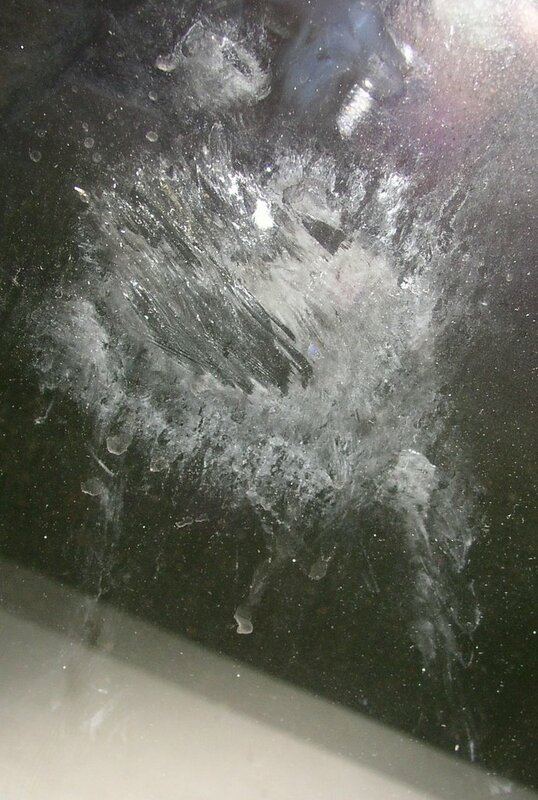 Yesterday HS was sitting in our bedroom when he heard a bang and looked up and saw that some bird of prey crash into our window carrying a pigeon. They both dropped to the ground and by the time HS reached the back door downstairs the bird of prey had recovered its wits enough to fly away leaving the pigeon (now, alas, a carcass) on the floor behind him. Just now when I went in there I noticed that you can see the outline of the hapless creature quite clearly on the glass - head, body and two legs. There is even a small white feather stuck to the glass. The last event of the 2006 Chester Literature Festival was a talk by George Alagiah who currently reads the main evening news at 6 o'clock on the BBC. I have followed Mr Alagiah's career with some interest since we were at the university of Durham at the same time; he had taken a sabbatical position after graduating the year before and I was a fresher. A couple of weeks after I 'went up' to Durham I noticed a small notice encouraging those people interested in producing an alternative prospectus for the university - one that would show what the university was really like from the undergraduate's point of view - to meet in one of the sabbatical offices at the Student's Union. It was there that I first encountered George Alagiah. I don't think I ever saw the outcome of this project but I did get involved and volunteered to interview the Secretary of the university on the admissions procedure. This Secretary, someone told me, could be a little ferocious, which made the idea even more attractive. I still wanted to be a journalist then (even though I was studying the sciences) and I thought the experience would do me good. However I have to report that I found this Secretary to be disappointingly courteous. He answered all my questions (which subjects required the lowest grades for admission, for instance) and I wrote up the report and handed it to George at the Student's Union for the proposed publication. He duly expressed his utterly huge and profound admiration at my great feat (which in truth was actually not that impressive) and at the end of the year invited me to his party. I didn't go. By that time I had come to realise that I had to make a choice between getting a good science degree and becoming a student journalist. I found the Student's Union newspaper at Durham quite unwelcoming - in fact I rarely found anyone there. I suppose I didn't persist enough - but it did seem to me it was far easier for an Arts student to become involved than a science student. The science student's time-table was crammed with lectures and practicals and the labs were a good walk from the science faculty; whereas the arts students seemed to have the odd lecture or tutorial and the rest of their time was their own. Soon, after phoning Shirley Williams (who was one of the heads of a new political party) for an interview (and being astonished at the ease at which I got through to her), I gave up - I had got a third class in one of my papers which shocked me into working. I decided to get my degree and then try my hand at professional writing, but in the end it took a good few more years than that to get anything published. But I digress. 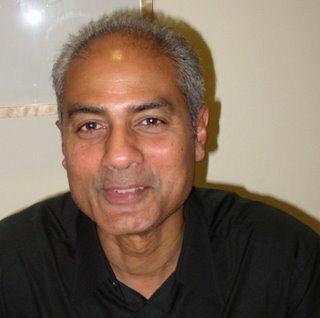 The George Alagiah I encountered in that Student Union office is quite a different man from the one I heard last night. He pointed this out himself in a short clip of film he showed at the beginning of the talk. I found it poignant: first we saw the photograph of a young Indian child in some exotic warm location and then the voice of that child - high-pitched with a pronounced Indian accent speaking an English that was clipped with a distinctly colonial register. 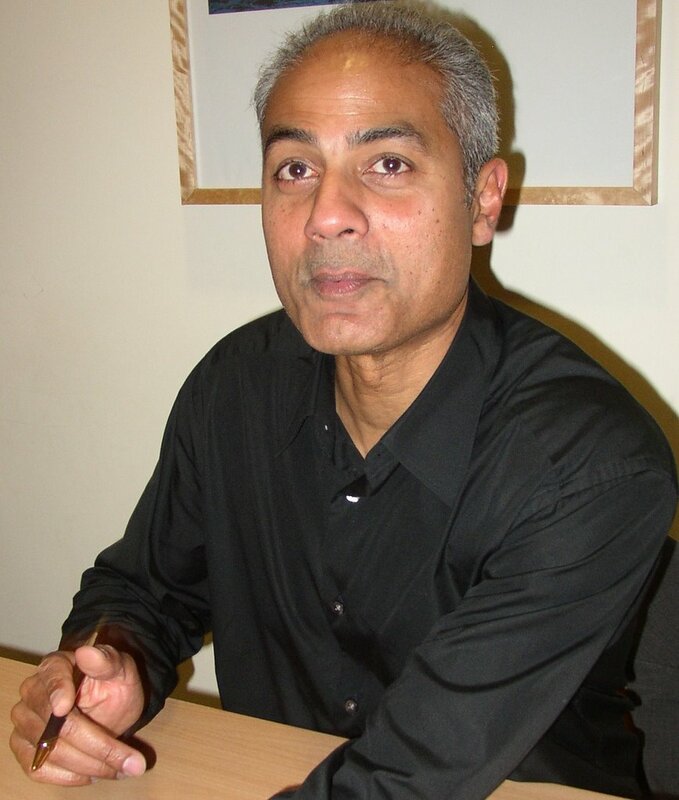 Then it cut to an image and sound that was familiar to millions of British viewers - George Alagiah reading the six o'clock news - a broad, paler face with grey thinning waves of hair and the voice deep, reassuring, archetypically twenty-first century BBC British. 'We've come a long way.' he said to me when I gave him a copy of my novel after the talk as a keepsake. He didn't remember me of course; people quite often don't remember younger companions, I find. But he remembered the prospectus, and he remembered the name of the man I interviewed. 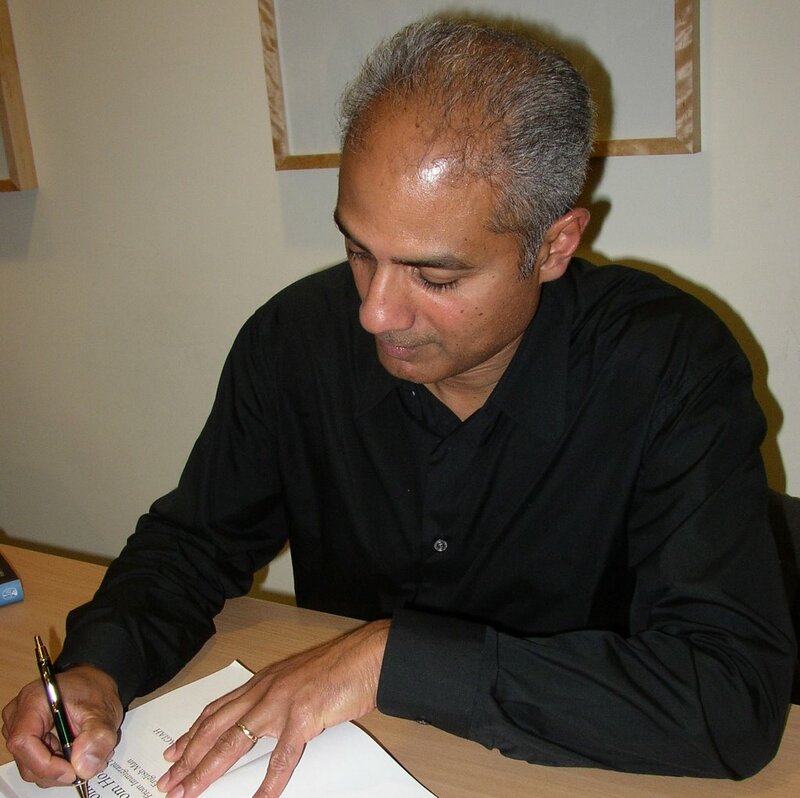 George Alagiah has written two autobiographical books. The first, OUT OF AFRICA, I read soon after it came out about four years ago and I can vouch for its excellence. The sections on being a reporter in Africa are personal, interesting and in some parts very exciting and tense. I kept hoping there would be a section on Durham but, since the focus was Africa, there was very little. 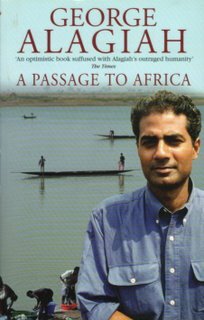 The part I liked the most was on his time in Sri Lanka, before his family made his first migration to Africa. I remember it as beautifully written and I would have loved to have read more. He pointed out the cultural change and this was a theme he came to again last night in his talk. '...the well at my grandfather's house in the little eastern town of Kalmunai as he poured cold water over me. From where I stood I'd look up to see this vast expanse of belly hanging over the knot of a sarong and, further up, a kindly, indulgent face smiling down at me. He explains he was embarrassed, hurt, and wanted to run away and cry but all he did was stood and smiled and wished he could disappear in the steam. In his talk George Aligiah explained that this boy really wasn't a racist. He said that recently he had met this 'house joker' again and they had hugged and swapped jokes. I suppose it is the way of the child. They hurt those who stand out and are different - and there are so many ways to be different apart from colour. Another attribute of children, George Alagiah says, is that they are natural integrators. 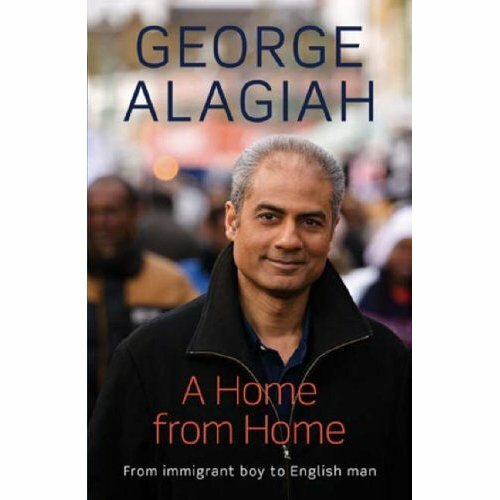 A HOME FROM HOME is about George Alagiah's integration into British Society - 'from immigrant boy to English man'. He compares the child he was then with a child of today who is also seeking to integrate into the society around him. The child that he found, Joshua, lives in the Tower Hamlets area of London where 96% of the children (or their parents) are from a province of one county within Bangladesh. This means that Joshua, as a white child, is the one finding himself in a strange country and like the child that was George Alagiah wants to integrate; but when he invited his friends from school to a birthday party no one came. It didn't used to be so bad. Older people in the community told George that they remembered the 'bad old days' - before 'multiculturalism' started in the 1960s when, despite the obvious racism, people had to get on to survive. George Alagiah is careful to report just what is happening and, mindful of his position as a senior reporter for the BBC, is equally careful not to express his opinions of what should be done. For instance he is careful not to have an opinion on the wearing of veils or single faith schools; and when asked about these two issues he threw the questions back to the audience - phrasing them so that his opinions became quite clear. One of the last questions caused him to contrast the attitude towards immigration in the USA and the UK. In the US, he said, they celebrate immigration with a fine museum and silver plaques at Statton island. The equivalent in the UK is a place called 19 Princelet Street in London, which housed waves of immigrants (including Huguenot silk workers who are my ancestors). It is, says George Alagiah, in contrast to fine museum at Statton Island, a building under threat of demolition. I am not sure I shall keep HOME FROM HOME or give it to my brother's widow, Y, who is a British-born Muslim whose parents come from India. Y has strong views (very similar to George Alagiah's) and has worked to become a valuable member of the mixed community around her. In some ways I think she is more integrated into English society than I am. All of us, to some extent, are descended from immigrants. Maybe the feeling of being proud to be British (which George Alagiah says is a good thing) comes from confidence in who you are and the people around you rather than from where and how long ago you came. Patricia Duncker and the High Sheriff's Prize for Literature. 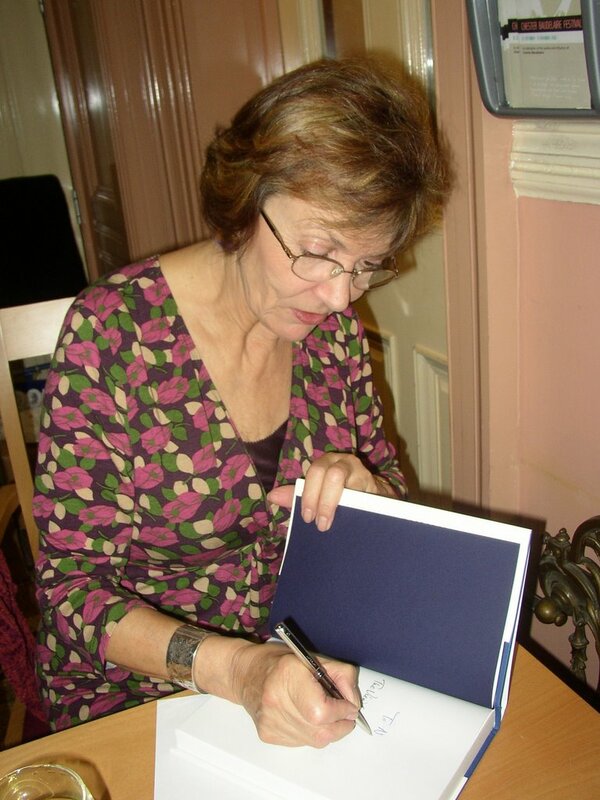 On Wednesday night the 2006 winner of the High Sheriff of Cheshire's prize for Literature was announced. The local dignitaries were there including the High Sheriff who initiated the prize and the current High Sheriff - who was a charming man in full attire including a sword which I was fascinated to see was genuine. Also present were the Lord Mayor of Chester, the vice-chancellor of the university, the head of the English department, where I used to work (albeit fleetingly) and the novelist who was presenting the prize - Patricia Duncker. 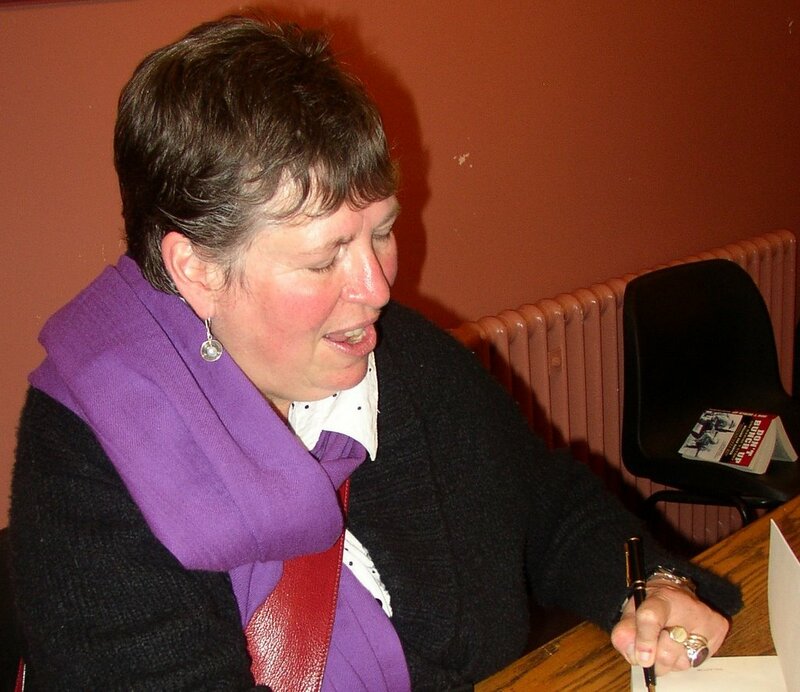 Patricia Duncker is a highly regarded novelist. 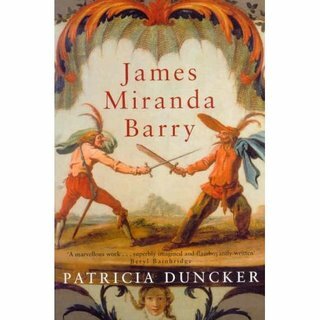 In fact when I asked one of my editors for a list of recommended reading one of Patricia Duncker's novels -'James Miranda Barry' appeared in the list of about 25 contemporary books; so I was looking forward very much to what she had to say. She is also professor of writing at the University of East Anglia - which is home to the country's leading MA in creative writing. Patricia Duncker approves of prizes and awards. She says they are important in that they give a writer confidence and a sense of achievement. During the reception before the event one of the judges told me that the administrator of the award had made special pains to ensure that the entries were indeed anonymous - the judges would have no idea who had won until the name of the author was read out at the end of the evening. And that is at the very end. Whoever organises the evening must take malicious pleasure in drawing the evening out for as long as possible. First the invited author is introduced, then she gives a talk, then a reading of about fifteen minutes, then the chairman of the judges gives a long summary of that years entry, then the three runners up are announced and then the winning story read out by the guest novelist. Only at that stage does the winner know he or she has won. Then, after the sheriff has given a speech that must last only for about ten minutes but seems like much longer, the winner's name is read out. Very cruel. This year it was Simon Gotts, someone I have known for years and a member of Chester Writers - pictured below - so I was delighted for him. 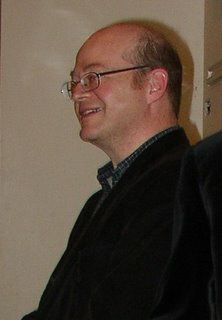 Another member of the group, Clive McWilliam, was one of the runners up - so an excellent night for Chester Writers. Pactricia Duncker's talk before her reading was most interesting. Writing, she says, is a risky and difficult thing to do. She says that it is essential in her opinion to be ambitious and to continually aim for something higher. It is bound up with reading. According to Donna Tartt, she says, the only advice she gives to becoming successful is to read. One word: read. But you should not read just anything but you should read something difficult, something you find hard to master and try to master that yourself. Patricia Duncker also believes that a study of the history of the form is useful. She herself is an expert on eighteenth and nineteenth century literature. It is not necessary to have an interesting life. It is much more important to have a mastery of image and language. She went on to consider the short story. A short story can be anything from one page to 40 pages long but must have enough impact to be read in one sitting. It is unlike a novel, which you carry around with you in your head for days at a time and may not want to end, if you love it. A short story may contain a firecracker or a depth charge. There is often a shock which may sometimes be gentle but sometimes quite large. A test for a good short story, Patricia Duncker says, is like the test for a good novel - does it have the 'Lingua Factor' i.e. can it be remembered after reading 15 other novels? There is sometimes a hostile response to the short story. It is sometimes thought to be not as satisfying as a novel and may be disturbing rather than comforting. The short story is closely related to poetry and dream. There tends to be less memory and history. There are more gaps which are evocative of dreams which the reader must fill in. So many short stories demand an intense relationship with the reader - requiring the reader to engage and make more of an imaginative leap than they would with a novel. It needs to have tension, emotion, change, a good story and a strong evocation of setting. The setting is particularly important she thinks and is related to the 'lingua factor'. You can read one of Patricia Duncker's short stories in the Barcelona Review (a link pointed out to me by Adrian (not the percussionist) Benson). Writing, Patricia Duncker concluded, is a public performance. It is hard to get right but can be liberating. She spoke enthusiastically of a book she read as an adolescent: 'Thief's Journal' by Jean Ginet. It was, she says confessional, dangerous and daring - which I think looks like some of the words that could describe the two books of Patricia Duncker's that she signed for me after the event: 'Hallucinating Foucault' and 'James Miranda Barry'. I am looking forward to reading them soon. They were both first published by Serpent's Tail the successful small press that is also publishing the Fall Anthology 'Perverted by Language' next year. Patricia Duncker is also contributing a piece of flash fiction to one of Pete Wild's other projects - another anthology. 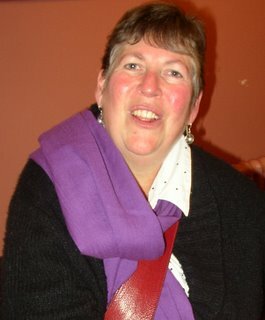 In fact Patricia Duncker seems to be quite a friend of the small press and acts as an editor for one of them in Wales. She is a friendly and approachable person and now have to report that on Wednesday night she won my slavish respect for evermore. When I asked her to sign my books she asked me for my name and it turned out that she has read one of my books. She could even remember its name. I was most impressed - and, I have to say, rather stupidly delighted. She asked me what I was writing now and I told her about the book that went into the publishers five weeks ago and how I was still waiting to hear with not an enormous amount of confidence or optimism - and explained why. 'Ah, mid-lists...' she said, and shook her head. 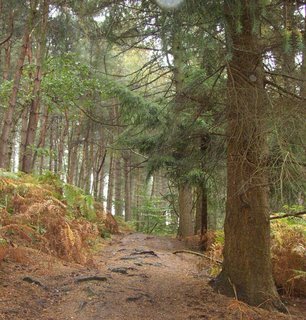 Half term - and an ideal opportunity for the Hodmandods to take a walk in the woods; even though it was raining, hard, and the ground was soft and waterlogged underfoot. 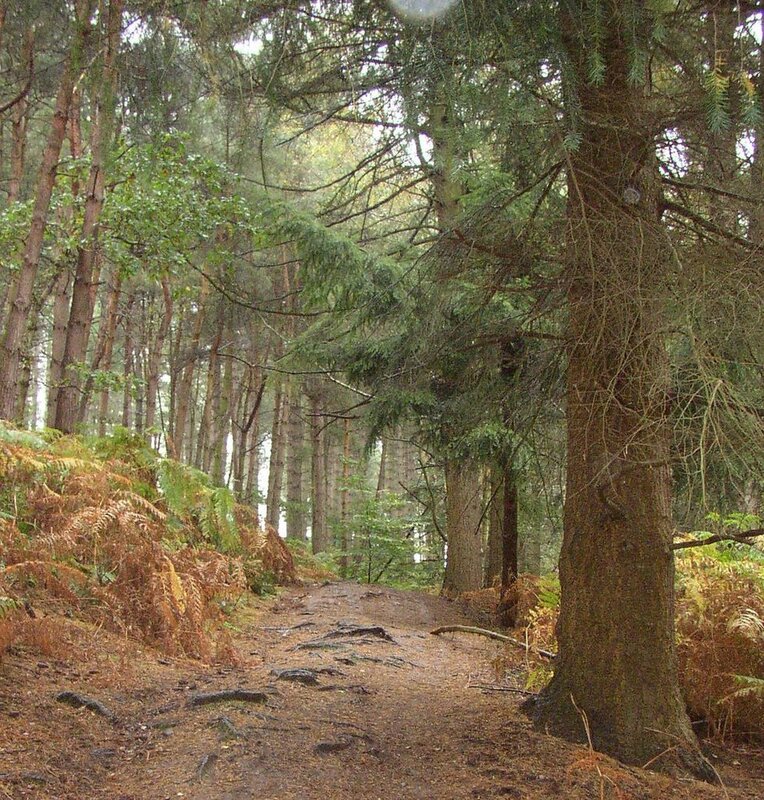 The bracken is dying now and the trees are ridding themselves of this year's clothing. So 2006. So this year. Time for something new. So they shake themselves naked; and their rags flutter in fragments to the ground and form a temporary mosaic. 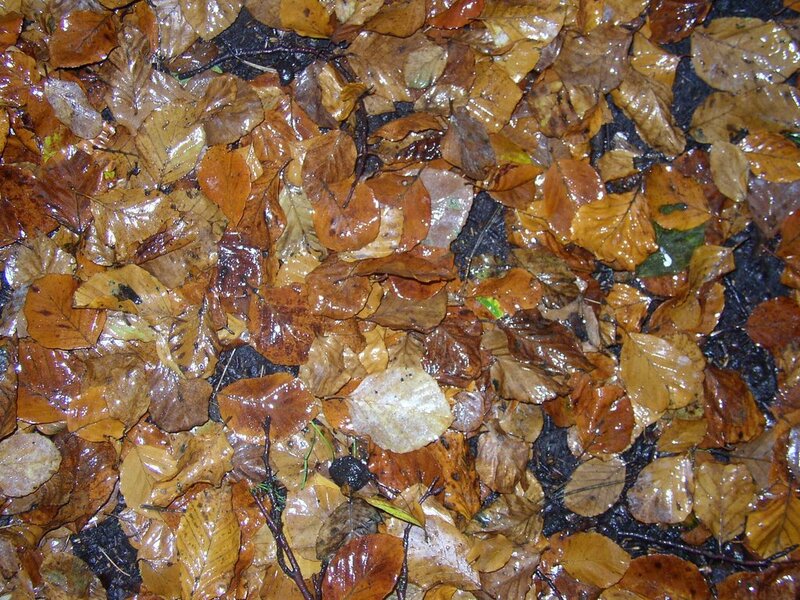 There is still a trace of green there, still some brown. Still some rich russets and some glossy auburns. Autumn. Like a vixen before winter. Held for a moment in this photograph - each ribbed leaf, each torn edge telling a tale: where insects drilled, where birds pecked, where the wind blew one against the other. Each one a miraculous little factory of memories in its layer upon layer of cells. This was 2006 - spring and then summer - and soon it will be gone. 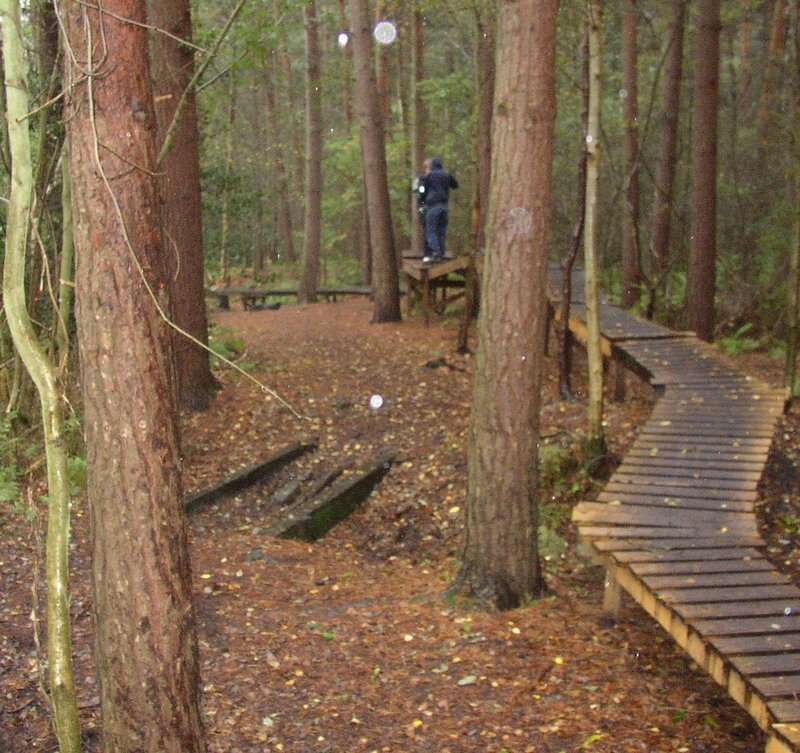 We came across a suspended cycleway which reminded me of the first Ray Bradbury story I read about hunters transported back in time to a primeval forest. For a while we dawdled along it - immersed but apart. 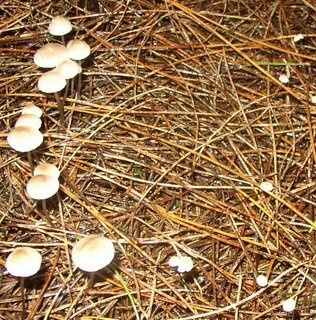 We were looking for fungus: it is Hodmandod Minor's big fascination. From an early age he has loved to look at pictures of toadstools - we used to buy him books on mushrooms and toadstools when he was still a very young child and then find them still open on his bed while he slept. Autumn is a good time for them but maybe this year we were a little late. People had obviously been before us; we found stalks and overturned cups strewn alongside the path as though we were exploring the field of a battle. 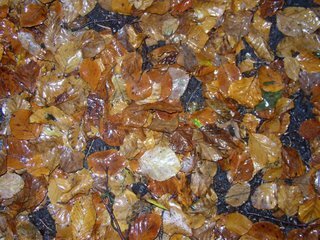 So we went off the path and further into the forest where the rain rattled off the trees, gathered into small pools on branches and thudded onto the ground beside us. 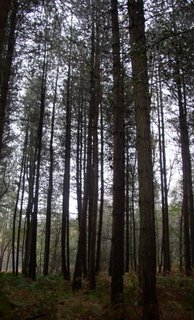 Deciduous forest gave way to plantations of conifers and the ground became softly padded with the luxurious pile of millions of old needles. 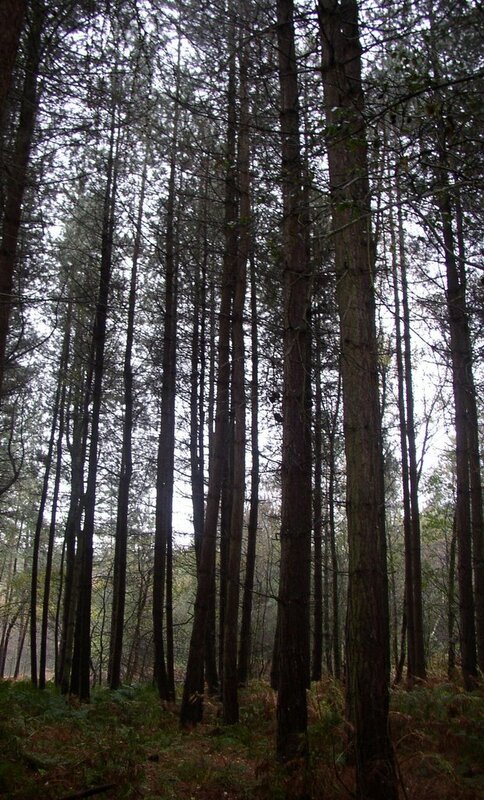 Above us the trunks of young trees moved gently apart with each gust of wind like the ribs of a sleeping giant. 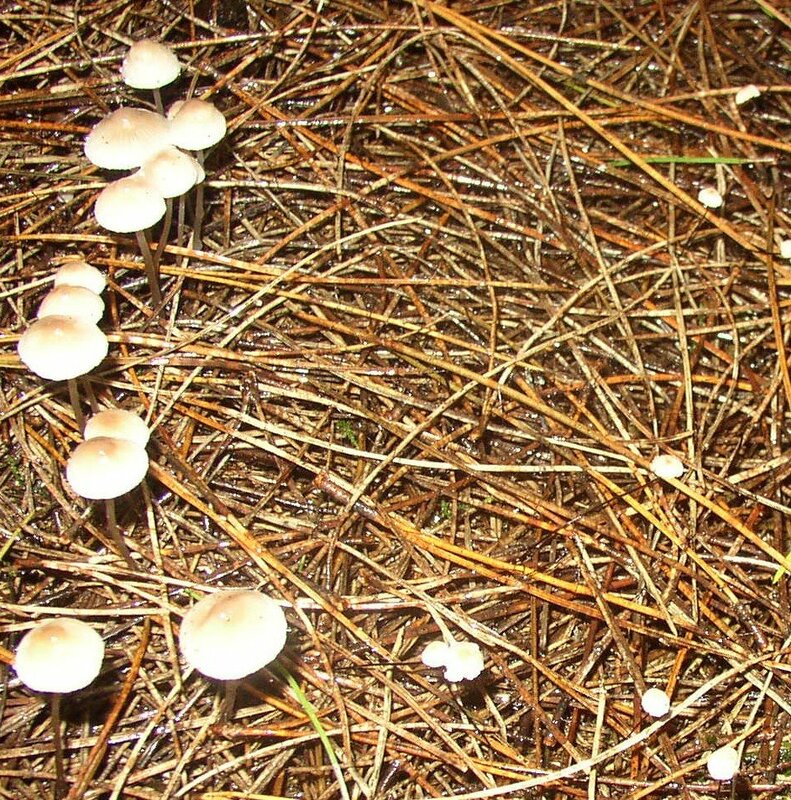 Eventually we came across some Fairy-Ring Champignon in a broken circle. 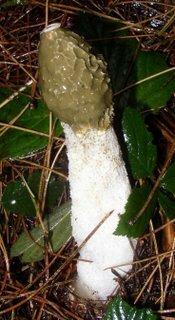 and two stink horns exuding a glutinous stinking glue - which is attractive to insects. According to the Stinkhorn homepage this fungus hatches from an 'egg' and relies on insects to spread its spores. A link brought to you via Susan. I find it very therapeutic. I just had a very interesting question sent to me from a university in the USA. In 2004 Professor Brian Josephson gave a lecture to a group of physics nobel laureates in Lindau. It was called Pathological Disbelief (you can see the slides for it here if you open the pdf file of the talk near the top). In the lecture, which sounds both entertaining and quite fascinating, Professor Josephson questions why certain ideas are rejected by the scientific community. The question from the USA was 'Is Continental Drift, as proposed by Alfred Wegener a fit example of Pathological Disbelief because he didn't fully explain the mechanism behind his idea. Was there any strong evidence for the solid earth theory that preceded continental drift? Did Alfred Wegener in fact suffer from Pathological Belief? I spent some time trying to answer this question today and so of course, as a blogger, feel compelled to post my reply here too. 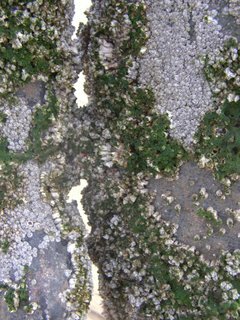 Continental Drift and Pathological Disbelief. In my opinion the response of the scientific community to Wegener 's hypothesis of Continental Drift was an example of Pathological Disbelief. Wegener had much evidence for his theory (or arguments as he called them) which disproved the accepted theory that the earth was solid, cooling down and shrinking (thereby wrinkling and causing mountain ranges and land bridges), and yet the establishment (as exemplified in the New York conference of Petroleum geologists in 1926) continued to believe in this despite a great catalogue complied by Wegener in his book The Origin of the Continents and Oceans' showing that the solid earth theory could not be true. The solid earth theory was contradicted by gravity measurements which showed that continental rocks are less dense than oceanic rocks which led to the idea of isostacy - that the continental rocks floated in the mantle -which implies a certain amount of liquidity. Furthermore if the components of the earth's crust were in such a system of equilibrium this would not allow rocks to bob up and down from one geological epoch to another - which would preclude land bridges. Another piece of evidence which supported Wegener's continental drift but did not support the idea of a cooling earth was radioactivity. This had recently been discovered and there was enough radioactive material being found in the earth for Wegener (and the rest of the scientific establishment, if they were not suffering from PD) to question the idea that earth was cooling down very much at all - certainly not as much as the accepted theory. The earth could not be contracting and crinkling as much as required either. Measurements on the folding observed in mountain ranges would seem to suggest that the rocks crinkled to become many times shorter length (and therefore that the earth had contracted a similar number of times in volume). 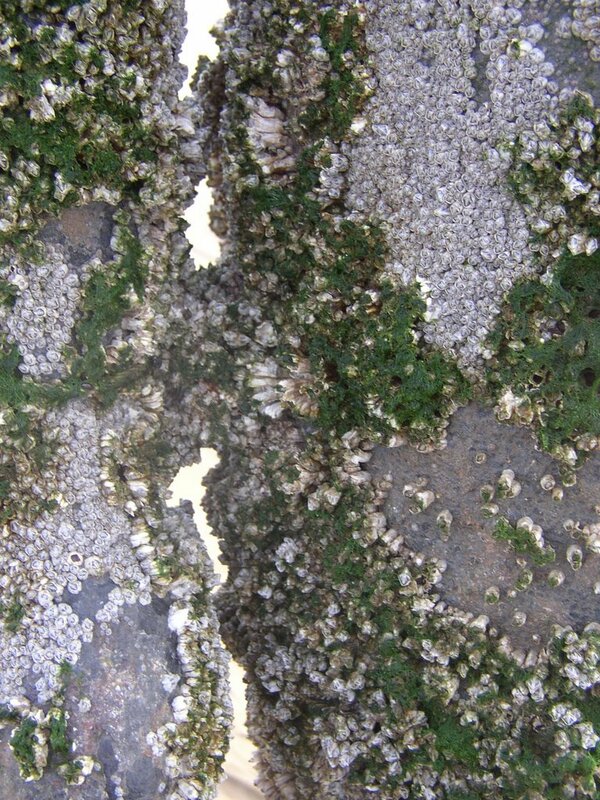 Wegener's idea that the uplift was caused by continents colliding and crumpling up oceanic sediment between them was supported by the marine fossils found high in the mountains. It would take someone with profound PD to argue otherwise. (v) simple matching of the outline of the continental shelves. He invoked the idea of rocks that had properties of solids and liquids and thus could flow and transmit earthquakes which was one of the main reasons why solid earth enthusiasts dismissed (or disbelieved) his idea. The fact that he did not have a mechanism for his hypothesis he did not regard as a problem. He simply said that the Newton of Continental Drift has yet to appear - and equated himself with Copernicus. He had so much evidence for his idea (evidence that was inconsistent with the other prevailing theories of the time) that he could not see how anyone could disagree with an idea that so neatly explained everything that had been discovered and was being discovered around him. It was the best model for the time. The evidence that came later (the magnetic stripes alongside the mid-oceanic ridges for example) support a new idea - that of plate tectonics which provides evidence for why the continents drift. It was only then, when there was a unified theory that explained a whole series of phenomena, that the idea that people began to believe that Wegener was right when he'd said the continents had drifted and the disbelief ended. People Collection - or 5 things not generally known about me. Remember that it isn’t always the sensational stuff that writers are looking for, it can just as easily be something that you take for granted like having raised twins or knowing how to grow beetroot. Mind you, if you know how to fly a helicopter or have worked as a film extra, do feel free to let the rest of us know about it :-)"
1. At school I was known as Dizzy or Diz. I was called this so universally and for so long that I began to forget my real name and often reponded to Liz or Lizzy by mistake. 2. Towards the end of my schooling I was described as a blue-stocking - mainly, I think, because I seemed more interested in my school-work than romantic attachments with boys - although most of my friends were male. 4. I recently learnt that my father sent me my first Valentine card because my parents felt sorry for me because my younger brother had received one and I had not. 5. I was engaged at the age of 22 - approximately 6 months after first encountering Hodmandod Senior in the NMR room. He showed me how to shim my first spectrograph and for this I was so grateful I agreed to go to the theatre with him. Now who shall I tag with this meme? Maxine, Marly, Mumpsimus and Jeff Van derMeer...but only if you can spare the time of course! 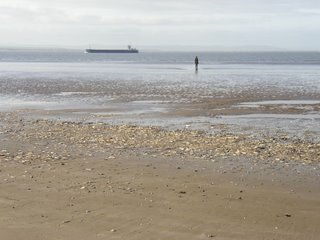 When Hodmandod Minor was indeed very minor, I went to work in the evenings analysing water for the local water company. It was a monotonous but useful sort of job and when I left I was given some book tokens. These book tokens had a huge value it seemed to me and so I went to a local bookshop and indulged in buying some big books that I wouldn't normally buy. 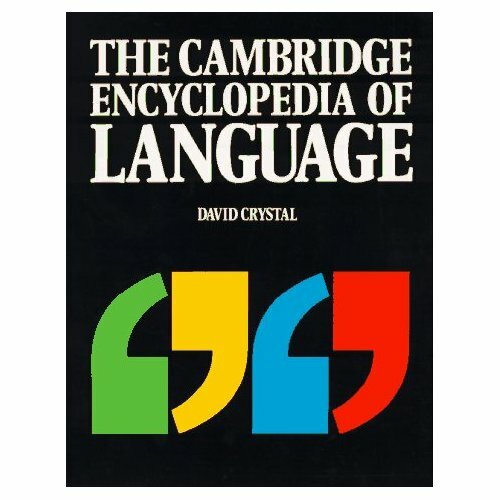 One of the books, which turned out to be my favourite, was THE CAMBRIDGE ENCYCLOPEDIA OF LANGUAGE by David Crystal, so I was delighted to find that the author was attending the Chester Literature Festival this year. 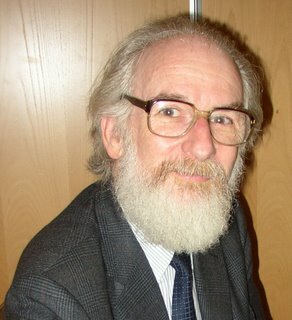 As John Elsey, the founder of the Chester Literature Festival pointed out in this speech of thanks Professor David Crystal has written many books including one on grammar which my son used for his course in A level English language, and one on endangered languages - a topic that has interested me recently. He has also written a book on language and the internet which was first published in 2002 and is now in its second edition - a reflection of how fast things are moving in this area. David Crystal is an entertaining speaker, peppering his talk with demonstrations and movement. There was a section where he carried out a conversation with himself and this was resumed, at intervals, throughout the talk. He started with the question how can you tell if you are addicted to the internet? Apparently, if you google the terms Internet addiction (I tried this) you come up with certain criteria. I went through the list. I think the answer in my case is probably yes, but I am really not bothered - especially since there is a blog for me to discuss my addiction with other users. 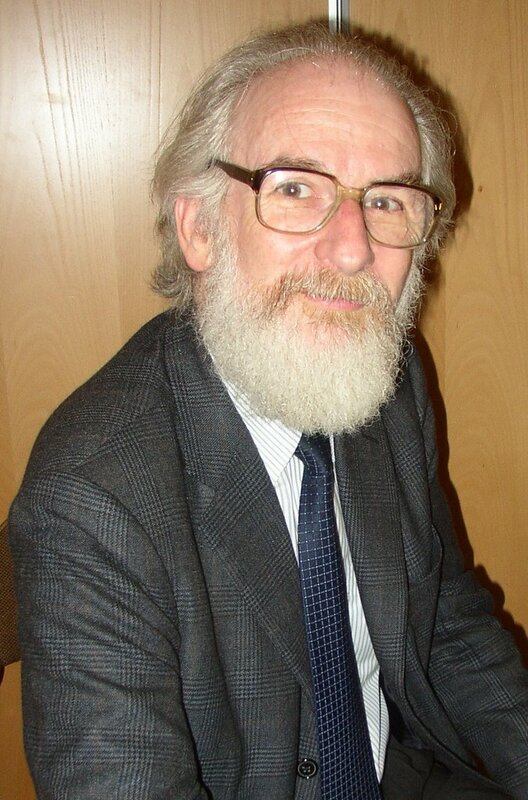 David Crystal offered his own criteria: if you visit the bathroom in the middle of the night does it occur to you to check your email on the way back to bed? There were others but this one appealed to me - because, I am afraid, the answer was yes. All the time. Without fail. In fact sometimes I lie awake thinking about going on-line - well not on-line exactly, just writing something. Usually it ends up on my desk top or in the middle of a novel but sometimes it does end up in the middle of a blog or an email. Strangely, after I have finished I go back to bed and go straight to sleep. This is not supposed to happen, I know, something non-stimulating is supposed to be the ideal thing to do, but it doesn't work for me. But I digress. 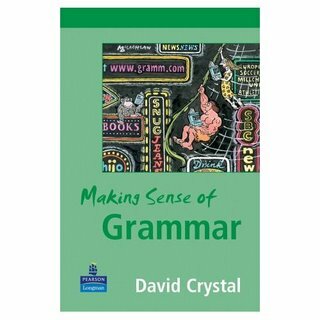 The internet, David Crystal says, is ideal for the linguistic addict. It is the latest of the major linguistic revolutions: the first was speech - about 100 000 years ago, the second was writing (separately evolved in different parts of the world 10 000 years ago) and the deaf sign language - no one knows when this evolved - maybe 500-600 years ago, but maybe much earlier. The electronic revolution has changed language in a way we have never seen before. When we communicate electronically we say we are 'talking' on the internet even though we are writing words on the screen. In fact we are doing neither. We are not having a conversation because there is no simultaneous feedback. The feedback comes later. There have been attempts to enliven conversations in chat rooms, MSM messaging and emails by using 'emotocons' but these have not really caught on. Only 12% of internet users use them. Other differences is that gender is sometimes withheld (60% are not the gender they say they are), as are the person's name (90% use made-up names), age and what they look like. It is also possible to have a conversation with many people almost at once in a chat room - which is different from conversation in a party. Communication is not like writing either because since the system is dynamic the content is not permanent and may be refreshed; and furthermore features like pop up advertising mean that there is animation and movement - which is missing from the conventional written word. 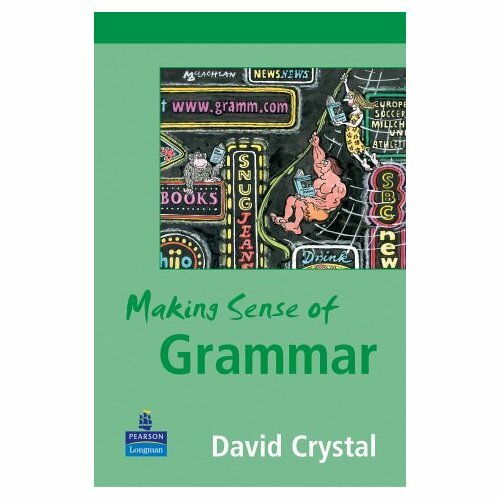 Another important difference is that email replies are frequently 'framed' in that a person replies to key parts of a person's email by 'framing' the answers within the original text (David Crystal estimates that this can happen 7 times before the result becomes unintelligible). There is also the possibility of hypertext links. As Jim Burnesley said in 1991 in the internet 'everything iis connected to everything'. These are the approximate dates the different communications first became popular and widely available. Blogs, he says (after a quick explanation of what they are which I think I needn't give in this context!) quickly become focused and bloggers find other bloggers with similar interests. I nodded my head again here. It also gives the linguist a chance to see something quite extraordinary; that is language in its 'naked form' (i.e. how it is used with no interference from editors). There has been nothing like this since Chaucer's time. Chaucer wrote language as it sounded (just as in my competition in fact - only 10 days left now) and was inconsistent in spelling since Chaucer used several different scribes (some of them were Dutch, apparently, which is why extra letter were put in some words - like the 'h' in ghost). He says that although the internet has brought few new words to the English language (only 500-600) and there has been no major revolution in grammar - there has been a revolution in style, opportunity and expression. The next five years will bring even more changes than the last five years. He expects the auditory revolution will be the next big change. Also other languages will gain a larger share - in 1997 80% websites were in English by 2003 less than 50% were in English. Continents such as East Asia (China), Africa and South America will 'join in' and there will be more sites in Spanish and Mandarin. Eventually the internet will reflect the ratio of languages in the world and a third will be in English. The internet will help to keep endangered languages alive. 50% of languages are in danger of extinction and the internet is a boon; both enabling individual speakers to keep in contact even if distant, and being of big interest to teenagers - a vital aspect in keeping the language alive. For instance there are many sites in Welsh and this is helping to preserve the Welsh language with some success. Which reminds me - I really must try again to log on to that Lampeter on-line site and go over my Welsh. So many resolutions - so little time. Unfortunately the bookseller, who normally attends these events, did not appear. I expect he has a good reason - he is normally quite reliable. 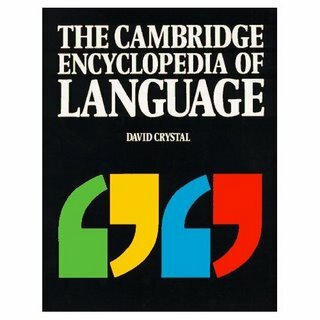 However this did mean I got massive kudos lumbering up with that great well-thumbed Encyclopaedia of Language I bought so many years ago. It is now adorned with Professor David Crystal's signature, so I am very proud. First he described the 'CREd 60% challenge'. 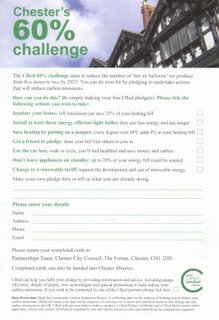 This is an initiative started by Chester City Council in which people pledge to: insulate their home; install at least three energy efficient light bulbs; keep thermostats at 18 degrees C; use the car less frequently; not leave appliances on standby; change to renewable tariffs and tell their friends about the scheme. 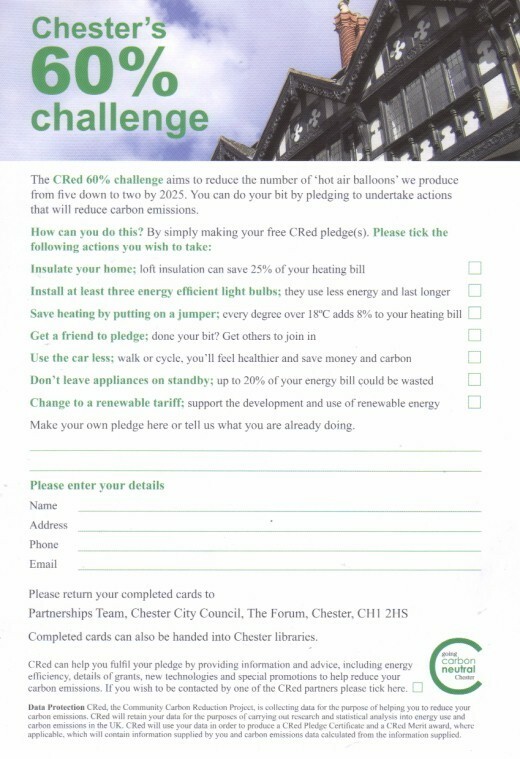 This scheme was, apparently, launched in Chester Town Hall last Thursday, although I was not aware of that. There was nothing in the local newspapers as far as I remember or noticed, which is surprising and disappointing given the seriousness of the situation. I think it should have been front page news. The aim to reduce carbon emissions by 60% by 2025. However, according to George Monbiot this is not enough. Second there is the very interesting scheme in a village called Ashton Hayes (5 miles east of Chester) which is aiming to become the first carbon neutral village in England in ten years time. I intend to find out more about this because I think this too has received insufficient publicity. 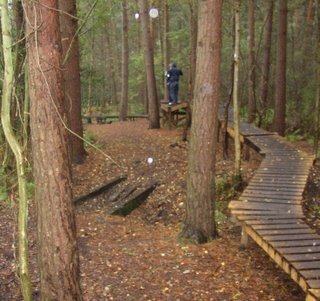 They are going to do this, according to a newsletter produced by the Geography and Development Studies department of the University of Chester, by using renewable technologies such as solar panels and wind turbines and increasing carbon 'sinks' by planting more trees and energy crops. However according to George Monbiot small scale schemes like these are not the answer either. George Monbiot is an enthusiastic and inspiring speaker, Even though the talk was long - an hour and three quarters altogether including questions - he held our attention throughout, although there were some who disagreed with what he said. Altogether I made eight pages of notes but will attempt to condense what he said here. The fact that we can change the atmosphere of out planet by our infinitesimal individual actions stretches our imaginations, but the planet could be destroyed by love - because many of the journeys we make are to visit people we love - and for each journey we make we produce carbon dioxide. However it is also possible that we can change the climate for the better with our individual actions. According to a recent paper in the Journal of Hydrometeorology the net effect of climate change would be to desiccate the plant. This would change the current net surplus of food into a net deficit. This would have a greater catastrophic effect on humanity that any previous war, plague or genocide. 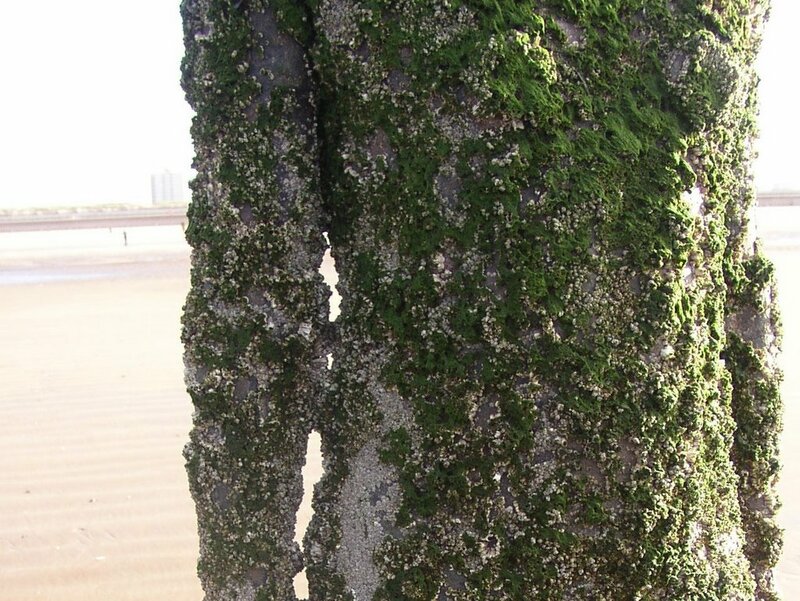 Apart from this net drying effect, the climate change would cause sea-levels to rise - and since half the world's population lives near the coast they would be displaced - not just by flooding but also by sea-water inundation making present fresh water undrinkable. We can only prevent this from taking place by ensuring that temperatures are reduced to 2 degrees below industrial levels. In order to do this we must cut carbon dioxide emissions by 60% by 2030 - and for this to happen emissions in the developed world must be reduced by 90%. If, conversely, the temperature rises by 2 degrees then feedback such as the permafrost melting and releasing a reservoir of methane in Siberia, will cause the temperature of the earth to rise inexorably due to natural effects and there will be nothing we can do. 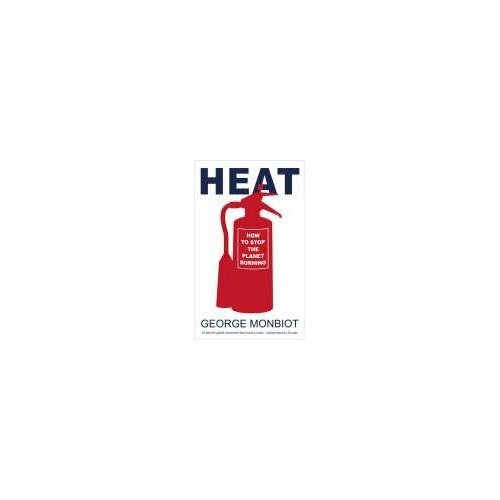 According to George Monbiothere is a denial industry that has been working hard to cover up this prediction which is the consensus view of most scientists. This, he says, is the same industry, the tobacco industry, that denies the harmful effects of tobacco smoke. The climate change denial was used as a smoke screen to distract the public from the findings on passive smoking - which were also denied. This fed on the fact that most of us do not want to hear what the scientists have to say and we have lost ten years (when we could have been taking action) as a result. 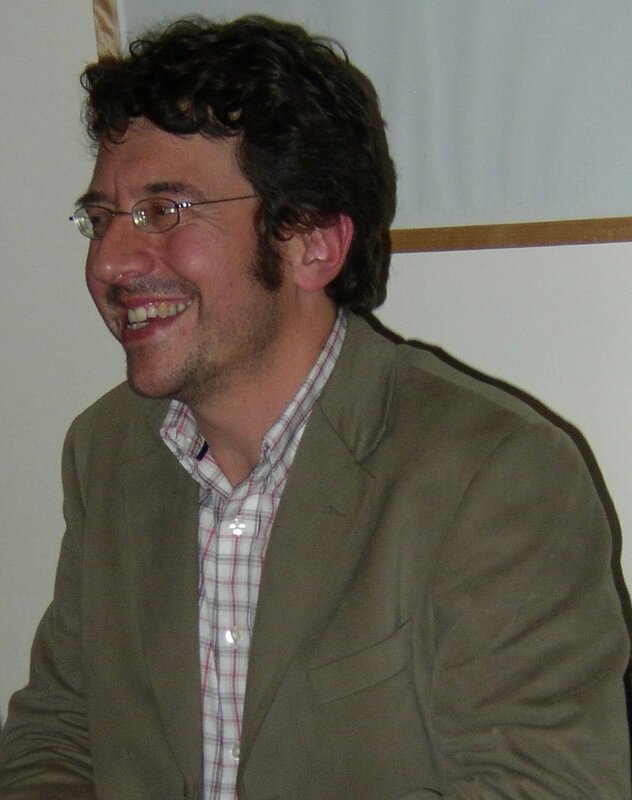 Monbiot has studied how we can achieve this 90% reduction in the UK and has come to the conclusion that there are various ways we can do this and live with the result. He describes these in his book called HEAT (not a title he favoured, he says). Many of the houses in the UK are so old and inefficient they are beyond hope. However with better regulations there is much to be done to the rest in terms of cavity wall and loft insulation. Appliances within the house could also be of increased efficiency. He suggests incandescent light bulbs should not longer be sold; points out plasma screens on TVs use 5% more energy than the cathode ray; and that fridges which have vacuum insulated panels are much more efficient than conventional fridges. These vacuum-panelled fridges are rated A++ but are little known because the rating system found in shops stops at A due to pressure from manufacturers. As for the provision of electricity - that should come from wind turbines out at sea which give a good reliable and consistent source. Similarly solar power in the Sahara could power Europe. The electricity could be transmitted using high voltage DC using new advanced materials. This method, he believes. would be a more efficient use of money than individual turbines (as in the Ashton Heyes scheme, I would guess). Land transport he believes should consist of a series of coaches using an adapted version of the current infrastructure of roads. He discounts hydrogen (too bulky to store), and biodiesel and bioethanol as fuel (crop used to fuel cars instead of feed people); advocating instead electricity with batteries replaced at 'filling stations' in place of petrol stations. The coaches would travel in priority lanes on the existing motorways with public transport linking the motorway junctions to the urban centres. He envisages these coaches arriving at frequent intervals so no one has to wait a long time. However, for aviation there is no satisfactory substitute. Hydrogen, ethanol and diesel are all unsatisfactory as fuels. Flying must be cut by 90% and in order to achieve this he suggests that there should carbon rationing with everyone being given a quota - so that people who wish to have more buy it from those who have no use for theirs. In answer to questions he said that the government energy review is not enough: they advocate a 60 % reduction by 2050 when he thinks there should be a 90% reduction by 2030 - anything less will lead to a point of catastrophic feedback. Coaches, he says are more efficient than trains and require no new infrastructure. Planting trees will not compensate for the change in climate quickly enough. He admits that the industrial development in China and India is problematic but says that we must show the way as we produce the most greenhouse gases per head of population. 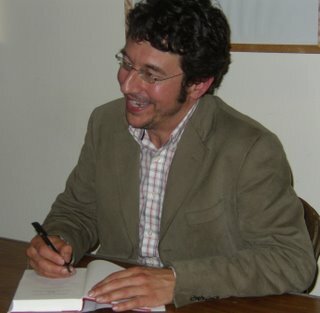 George Monbiot's summary was most inspiring. He says that the present generation on earth have a responsibility to confront global warming as future generations depend on them. This is a mind-numbing concept but also gives us something big to do with our lives; something of mythical dimension. 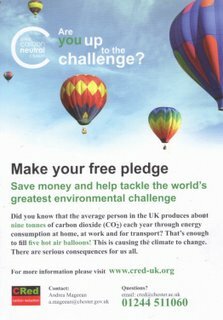 Our response must be to begin right now and join in the campaign to prevent climate change. I came from the talk determined, I suppose, to do better. As I drove home alone in my own car I wondered if I needed it and whether I could live my life without it. I went through my week and thought of how I use it: for the weekly shop, the meetings with my friends and my sessions at the gym. They are all small journeys (the worst sort, environmentally) and I suppose I could use public transport or walk (riding a bike is out of the question because the roads around me are too busy to be safe) to get to most of them - although I would have to shop more frequently... and everything would take much longer. At the start of the journey I was determined to try but by the time I arrived home this had faded to a 'perhaps I might try'. But I shall. As I looked at our house I realised at least I needn't feel too guilty about not having solar panelling or a small wind turbine attached to the roof; but this weekend I am intending to clear out the loft. The insulation up there has never been adequate. One step at a time, I guess. And like the rest of the population of this country I need lots of encouragement. On Thursday Morning 12th October 2006 I took delivery of an essential piece of kitchen hardware. This is what happened. 'Fridge.' the delivery man said, already three steps back up the driveway to his large orange lorry. I fidgeted quickly around the house, closing doors on rooms of mess, picking up as much litter from the hall carpet as I could then went to the doorway again. The back door of the truck rolled upwards with the sound of soft thunder. Inside someone was already shoving the huge brown-covered parcel outwards. The delivery man caught it neatly on his shoulder - like a Miriam or a Ruth carrying the clay water pitcher from the well. He came towards me: gracefully, balanced, unsmiling. Behind him, from where the fridge had been, I had the impression of the silhouette of a man toppling silently towards the road: arms out, body arched. I stood aside, my eyes still on bushes that hid that section of the road where the man had fallen. No sound, no sign - as if a dream had suddenly appeared in my mind and then gone again. 'Well?' He was frowning now, swaying a little with the weight , so I gestured him through, watching him as he lowered the fridge to waist height to go through the doors. I nodded. I was still thinking about the man on the road. 1. Aydin of the consistently interesting SnailTails blog (recent posts on a beaver dam and the way museums prepare animal skeletons are particularly fascinating) tells me that the Steve Jones lecture is available as a podcast from the Royal Academy. 2. Also from the Royal Academy on Monday night is a live webcam broadcast of Douwe Draaisma's lecture on memory called 'Why Life Speeds Up As You Get Older' (the same title as his latest book which is a collection of essays. It starts at 6.30pm here. 3. Science Book Blog has an interesting list of favourite science books. 4. Jonathan at Connaissances has produced another couple of fascinating posts - this time on the language of food and 'the raw and the cooked'. 5. Pete Wild has another 10 chapters of Espionage published at Dogmatika. 6. While Lee's MORTAL GHOST continues to fascinate with chapter 13. 9. while at the same time, and most importantly, my BAFAB competition to find the best mis-spelt 101 word short story comes to an end too. So please do keep those entries er...flooding in, because I am finding it hard to keep up, frankly. 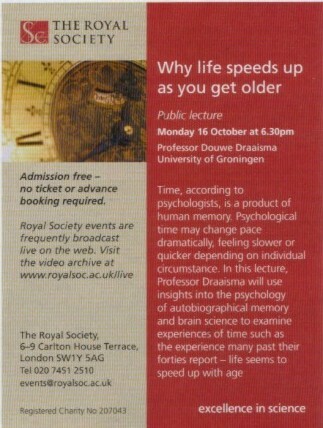 A talk by Joan Bakewell on Aging. 'Medicine defies evolution' Joan Bakewell says. To be honest I had not expected to hear such a succinct link with the Steve Jones lecture during Joan Bakewell's talk on aging. I suppose I had expected a series of show-biz anecdotes in what I considered to be one of the celebrity-type events of the festival. But Joan Bakewell is a witty, articulate (and still beautiful) woman. She is slim, moves with a grace that is too fluid to be called sprightly - which I guess would be the world that I should be tempted to use because Joan Bakewell is over seventy. In fact Joan Bakewell is just a year younger than my mother - and I would not call my mother sprightly either. But my mother isn't old (despite the fact that when she tripped over recently she called it 'a fall' : wrong thinking, I pointed out then) and Joan Bakewell isn't old either. Old age is in the mind I have decided; and some people will die young even at the age of a hundred. 'Three score years and ten,' Joan Bakewell says about her age, pointing out the biblical connection - the ominous biblical connection. Three score years and ten is equated with the end of life, she says, a preparation for death; but it should not be that. Dying is its own separate phase and for most of us it will, we hope, be a short one. Old age should not be viewed as a phase of decline but a period that should be welcomed in its own right. There are, after all, certain benefits to being older than the people around you : wisdom; a treasure house of memories; a free bus and tube pass if you live in London so you can wander at will'; sometimes a period of intense creativity (in people such as Verdi and Picasso who have spent their whole lives being creative as well as those who haven't and suddenly feel an urge to paint or write a novel); a love of learning for its own sake uncorrupted by career ambition; and, oddly, time. An older person has time to pursue interests and activities that a younger person has not. Older people are more interested in their health she says, and it because of improvements in health and medicine that we are living longer - with drugs controlling chronic diseases and technological advances providing us with replacement parts (heart valves and hips). She seemed very optimistic about the possibilities of stem cell science - medicine is on the cusp of being able to provide us with a vast range of replacement parts. I do not think she is right about this. Although it is a view promoted by journalists the stem cell research scientists that I spoke to last year seem much more pessimistic about the chances of making body parts to order in the forseeable future. 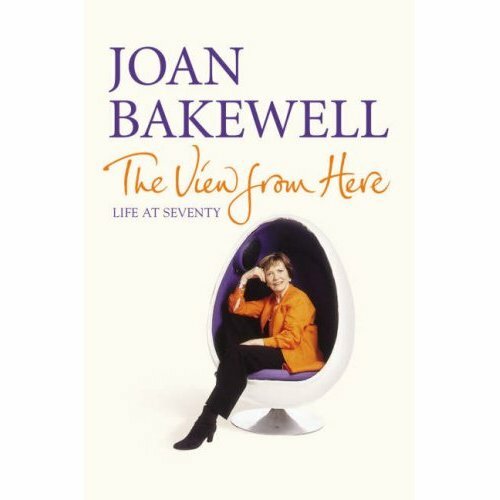 Joan Bakewell, then, describes a very positive view of life post seventy. Her column 'Just Seventy' (a play on the name of the now defunct teen magazine which was aimed at the young teen market, 'Just Seventeen') in the Guardian is something that she suggested to the editor and a collection of these have now formed the basis of her book THE VIEW FROM HERE; a book which I am sure is just as 'exhilarating, funny and always thought-provoking' as Terry Jones says it is (on the cover). However there is, of course, a 'but' here. 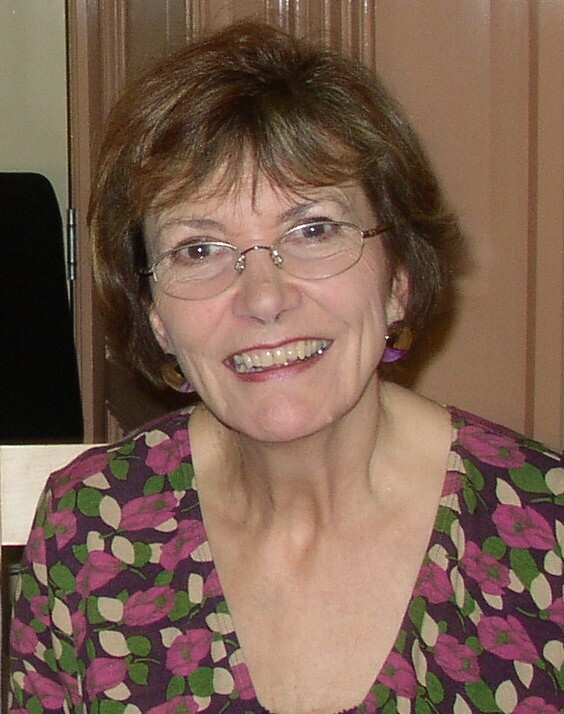 Joan Bakewell is healthy in body and mind. She is mindful of her health and when she felt her hearing was not quite up to par she wasted no time in finding herself a hearing specialist in Harley Street (an area of expensive private clinics), and when she found herself becoming a little forgetful arranged a series of tests for that too. Her hearing and mental condition, she says, were found to be fine - 'for a woman of her age' (she smiled at the qualification). This rapidity of expert treatment of course is a benefit of being wealthy. As I listened to this charming and attractive woman extolling the benefits of becoming older I kept thinking of some of the older people I know; the ones that are isolated, poor, ill, constantly wracked with mental and physical pain. I kept wondering if they would agree and felt sure that they would not. Old age is not a time to be poor, Joan Bakewell admits, coming around eventually to considering what some would consider to be the realities of life. There are sad times. 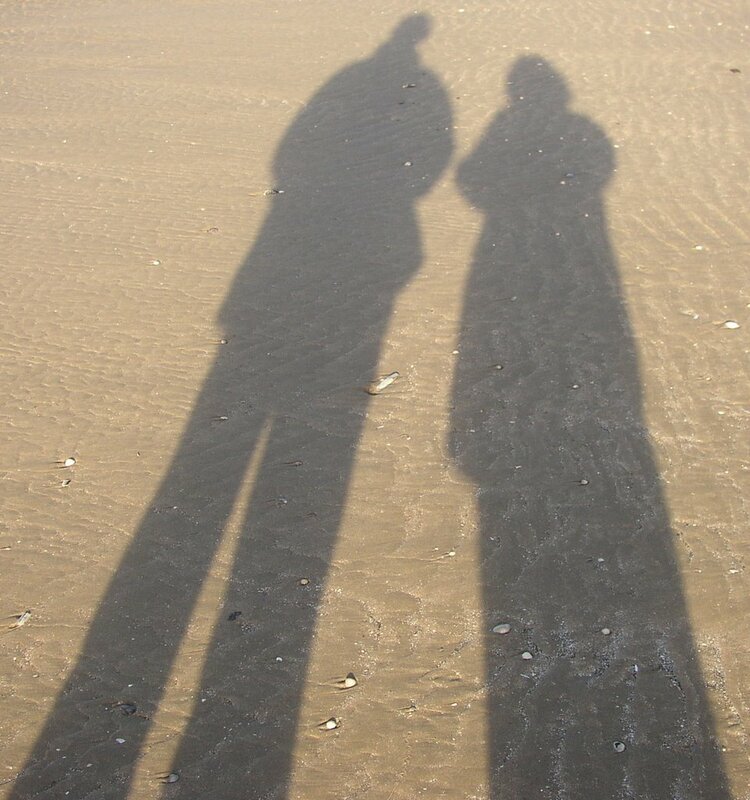 Bereavement, particularly of partners, she says, is traumatic. Her voice grew quieter then, her as if she was remembering, but then it became determinedly brighter again. Bereavement, she says, can also herald in a new era. There is not the same sense of reward and partnership but there is a new style of life, There is no point in grief holding you down. There are different rewards that can be spiritually enriching. This was my favourite part of Joan Bakewell's talk. I think because it shows the power of the human spirit. I am sure that successful (and by that I mean happy rather than wealthy) people are positive thinkers. They keep on going - in spite of loss they continue to grow, changing direction, accommodating the disadvantages of age, poor health and lack of wealth. Joan Bakewell's attitude is, above all, life-affirming. It is why I bought the book for my mother (who has also proved herself to be determined over the past eleven months and I am proud of her for that) and why, after she has finished it, I am going to borrow it and look at it myself too. The talk was sponsored by the 'Friends of the Chester Literature Festival' which organised the Stratford trip in September and provided 'Bakewell Slices' to go with the pre-event drinks which I thought was funny (they tasted very good too). Joan Bakewell was very ably introduced by Jan who provided a good and very interesting introduction (and has started her own blog here) while Gwen gave the equally entertaining vote of thanks.